Discover more about the products our guests can’t live without! Nourish your hair and nurture your spirit while calming aroma infuses your day. Create your own peaceful sanctuary. Deeply breathe in our calming aroma with 25 pure flower and plant essences including certified organic lavender, petitgrain and ylang ylang. 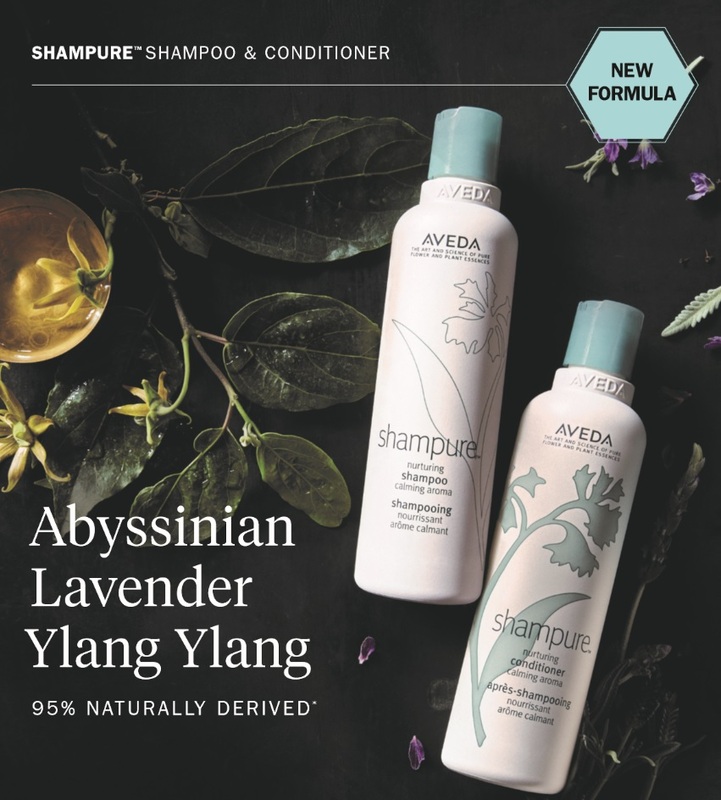 • 95% naturally derived* silicone-free shampoo and conditioner—with abyssinian oil—gently cleanses, detangles, adds shine, and provides weightless, long-lasting nourishment while infusing hair with our signature calming aroma with 25 pure flower and plant essences. • Packaged responsibly using 100% post-consumer HDPE. • 97% naturally derived* purifying shampoo and conditioner — formulated with micelles and white vinegar gently clarifies hair (without stripping) and helps prevent tangles and static, while leaving hair full of weightless body and shine. • It’s invigorating aroma with certified organic rosemary, peppermint and spearmint is proven to energize, awaken the senses and improve focus. • Leaves hair feeling squeaky clean, reset and shiny. This product is designed to make drying and styling less stressful. 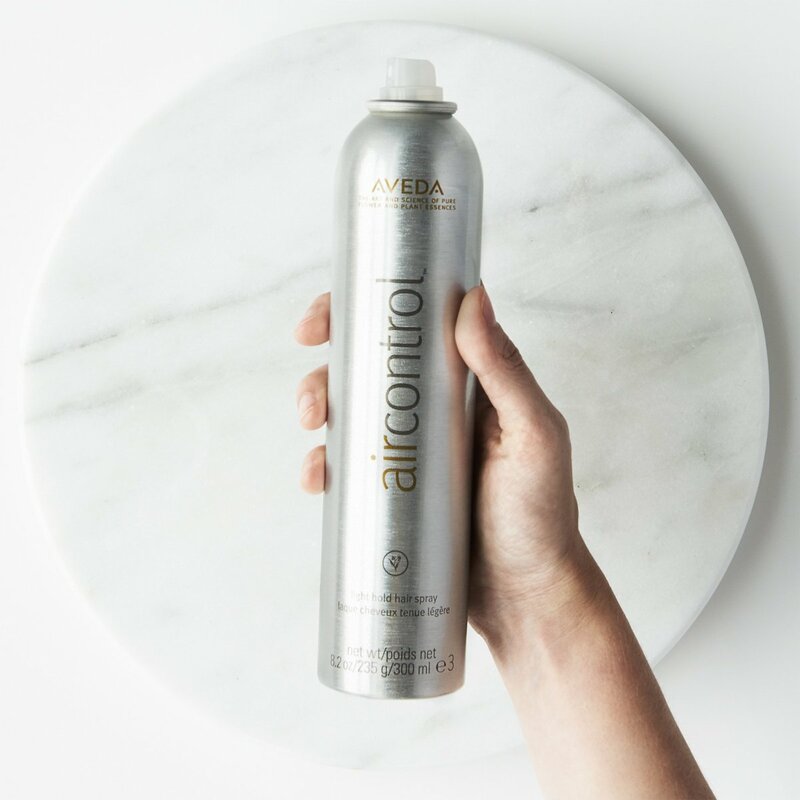 Air Control Light Hold Hairspray is the little black dress of mists: it’s flexible, versatile, and can make your look, no matter the occasion! Plus, it has a net-zero impact* on the Earth’s climate. Hold the can 6-8 inches from dry hair and spray in short bursts. Layer product to build more hold. To add volume, direct the spray towards roots. 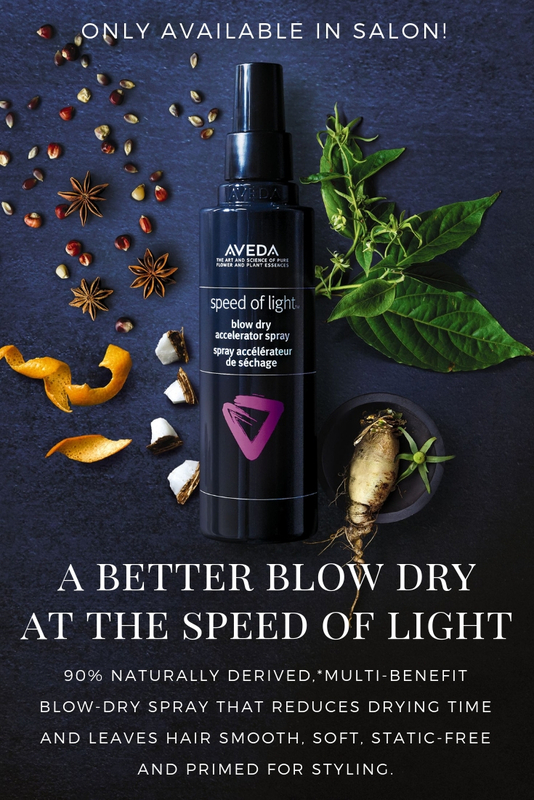 *Aveda funds renewable wind energy to offset the CO2 associated with the manufacturing, transportation and use of control force™ to help ensure it has a net-zero impact on the Earth’s climate. The majority of our offsets fund future wind energy over time. To learn more click here. Summer-proof your hair! 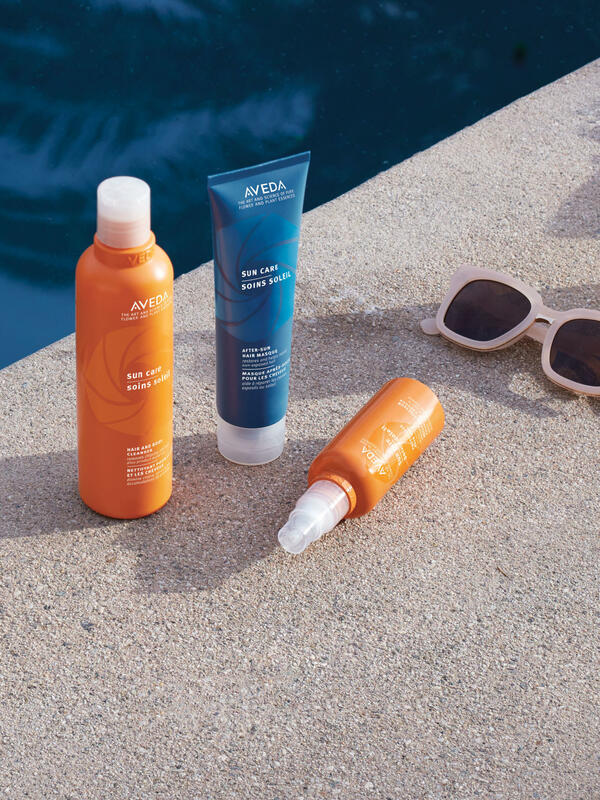 There’s nothing like the pure joy of sun and sea—enjoy even more knowing you can care for your hair before, during and after. An intensive cream masque that moisturizes to restore the look of sun-exposed hair. Remember how sweet life is every day with a gentle shampoo that helps treat your senses to soft feeling, sweet smelling hair! Babassu and coconut-derived ingredients deeply, yet gently cleanse hair while maintaining healthy lipids and oils. Certified organic coconut oil and shea butter deeply condition delivering superior slip and effortless detangling. 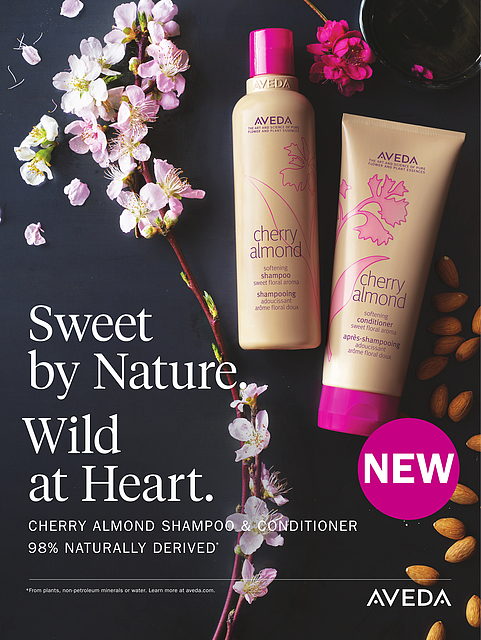 Formulated with naturally-derived cherry blossom extract and sweet almond oil restore softness and shine from roots to ends, leaving your hair feeling touchably soft and full of weightless bounce. Restructuring Shampoo gently washes away pollutants. Daily Hair Repair instantly repairs and helps protect against damage from heat styling—up to 450°. Intensive Restructuring Treatment repairs damaged and chemically treated hair deeply—and strengthens to help protect against future damage. 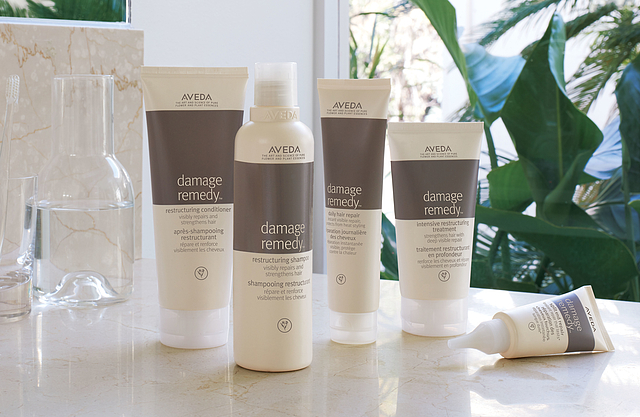 Restructuring Conditioner detangles and strengthens to help prevent breakage. Split End Repair instantly repairs split ends—and repair lasts through your next wash.
Shampure Dry Shampoo helps extend a great blow dry, revive hair after a workout, refresh hair while traveling and transform hair before a night out. • Make sure to turn the cap closed when you’re finished to avoid spills. Live a life complete with vibrance and radiance. 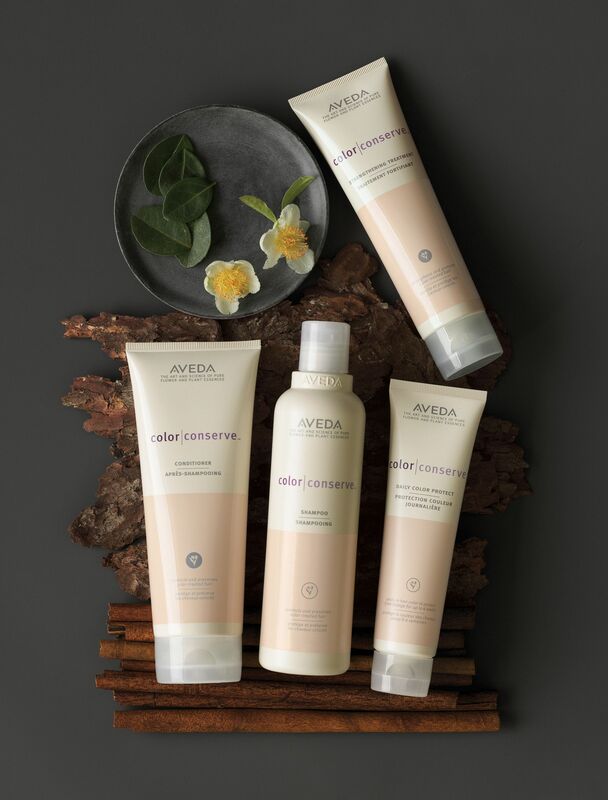 Feel as confident with your color as the day you left your Aveda salon. This 4-step system protects color by preventing fading. Gentle, plant-infused shampoo helps protect color by preventing fading. Formula with morikue™ protein and sunflower and macadamia nut oils helps to deeply nourish and strengthen color-treated hair. Leave-in treatment instantly intensifies color radiance. Seals and smooths the cuticle for increased shine. Every journey begins with a step. Thicker hair begins that way too. With our 2-step solution, thicker hair is yours. 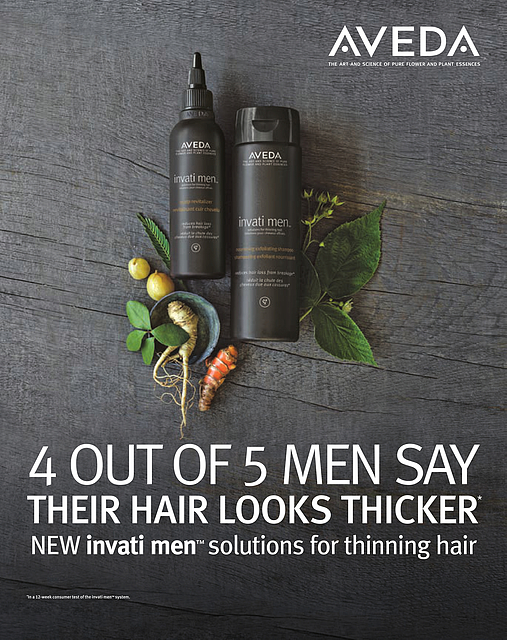 Reduce hair loss with 98% naturally derived Invati Men™—4 out of 5 men say their hair feels stronger and looks thicker. Invati Men™ Nourishing Exfoliating Shampoo cleanses and exfoliates the scalp with wintergreen-derived salicylic acid to remove build-up that can clog pores. Conditions to help strengthen thinning hair. Invati Men™ Scalp Revitalizer is formulated with amla to instantly thicken your hair at the root and a blend of potent plant actives to help invigorate your scalp when massaged in. • Invati Advanced™ Exfoliating Shampoo gently exfoliates, cleanses and renews the scalp with wintergreen-derived salicylic acid, removing build-up that can clog pores. This nourishing formula cleanses the hair and detangles to help protect from breakage during shampooing. • Invati Advanced™ Thickening Conditioner instantly thickens and delivers weightless conditioning to help protect the hair from breakage. Naturally derived amino acids mimic hair’s building blocks to help strengthen hair from roots to ends. • Invati Advanced™ Scalp Revitalizer reduces hair loss to help keep the hair you have longer. When applied once daily, this invigorating formula featuring our innovative blend of tangerine peel and Japanese knotweed penetrates to help support hair’s natural keratin. 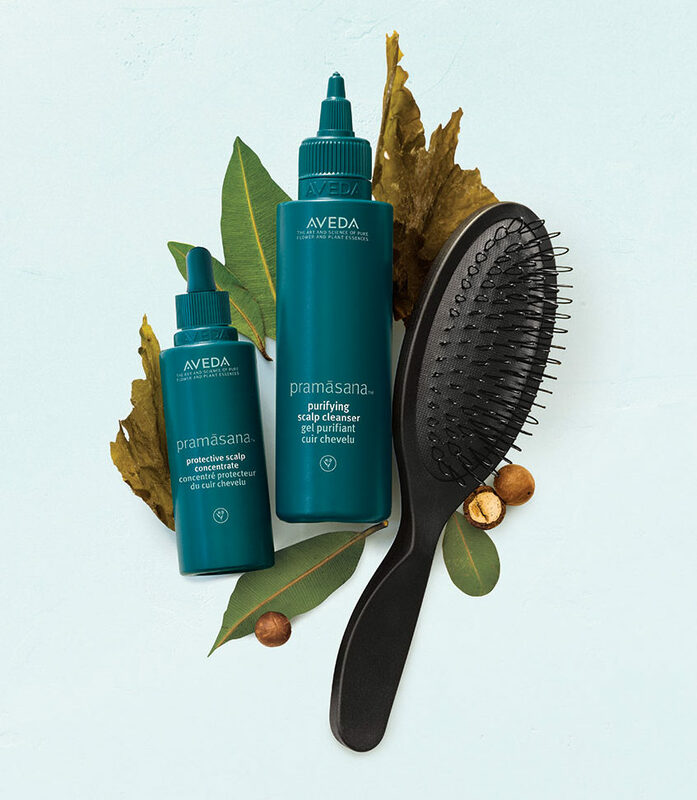 Certified organic amla instantly thickens to help lift hair at the root while our patented bio-fermented blend plus our Ayurvedic herb blend with ginseng and certified organic turmeric invigorates the scalp when massaged in. Deeply, yet gently cleanses and purifies the scalp to help instantly balance sebum levels. Plant-derived cleansing agents from babassu help gently cleanse and purify the scalp. Features an exclusive blend of ingredients that helps balance, protect and preserve the scalp’s natural barrier to help create a clean, healthy scalp foundation. How does texture tonic work? Magnesium sulfate (AKA salt) helps contract and compress hair for piecey texture, and cane sugar helps give hair a soft, not crunchy texture and shine. 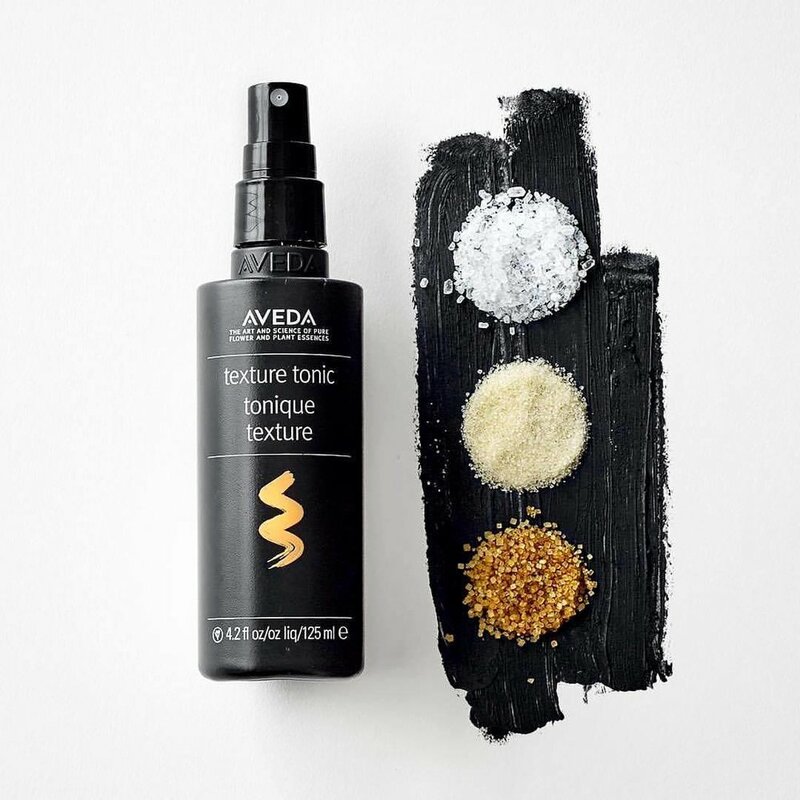 Use texture tonic to create beachy waves, enhance texture, or add grit and light hold to fine, silky, hard-to-style hair. Style on wet hair and diffuse or let hair air-dry — or scrunch into dry hair for a natural, glamorously messy look. Works for all hair types. 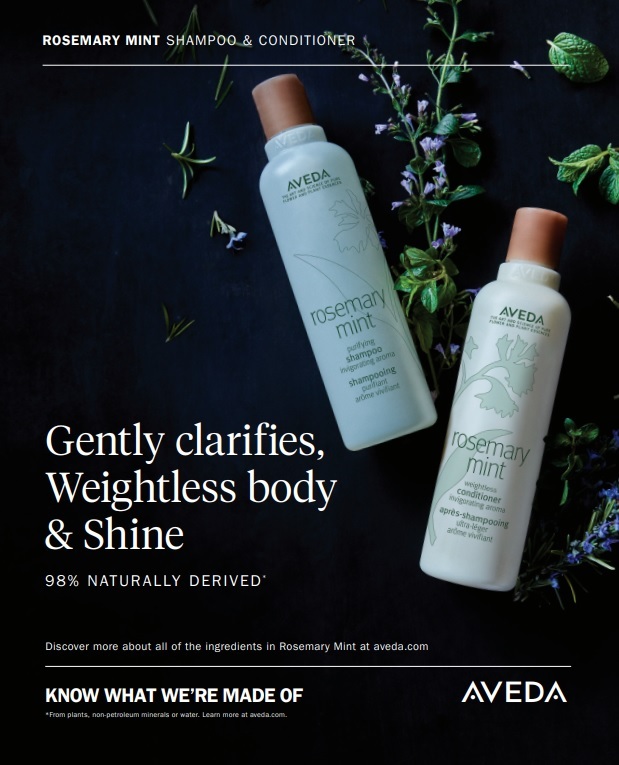 Infused with Aveda’s own pure-fume™ aroma with certified organic ginger, ylang ylang, clary sage and other pure flower and plant essences. 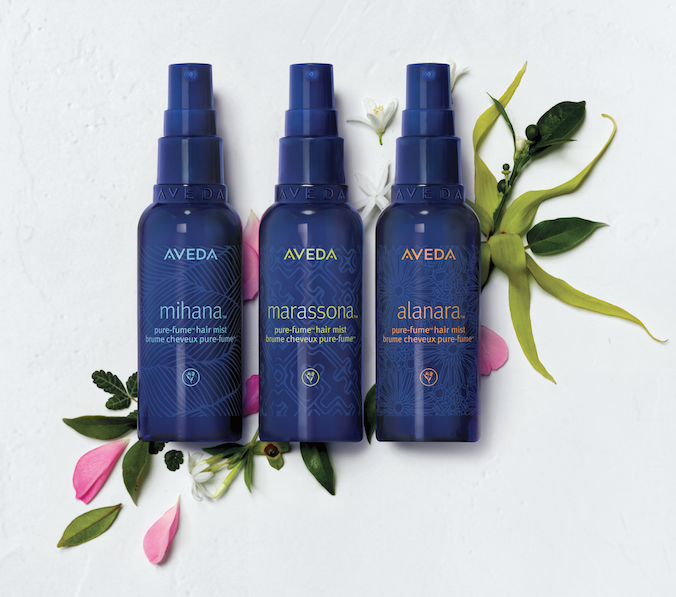 Aveda’s NEW Pure-Fume Hair Mists envelops hair with pure flower and plant aroma that lasts all day. • Quick-drying formula, with fine mist sprayer, won’t collapse finished hair styles. • Nourishing plant oil blend of certified organic sunflower and kukui seed oils also delivers softness and shine. Marassona– Inspired by the sensual, enchanting aroma of Brazil’s magical coastline where the forest meets the sea. Also infuses hair with softness and shine. Mihana– Inspired by the sensual, sacred forests and gardens of Japan where citrus mingles with spice. Also infuses hair with softness and shine. Alanara- Inspired by the rich island woods of the ancient Fertile Crescent valley of the Middle East where spices and blossoms collide. Also infuses hair with softness and shine.